If you are not familiar with the general location of Plantation Key, click HERE, then 'BACK' for a basic location map. Plantation Key once was the home of a large Indian mound. It was in the area of the Plantation Key Colony subdivision (MM 90). As stated previously, aborigines once lived throughout the Keys. Judging from the size of this mound, there must have been a large Indian settlement on Plantation Key or a smaller settlement for many, many years. Artifacts taken from the mound were dated by state archaeologists at Tallahassee from 500 to 700 AD. The site was leveled for construction in 1958. 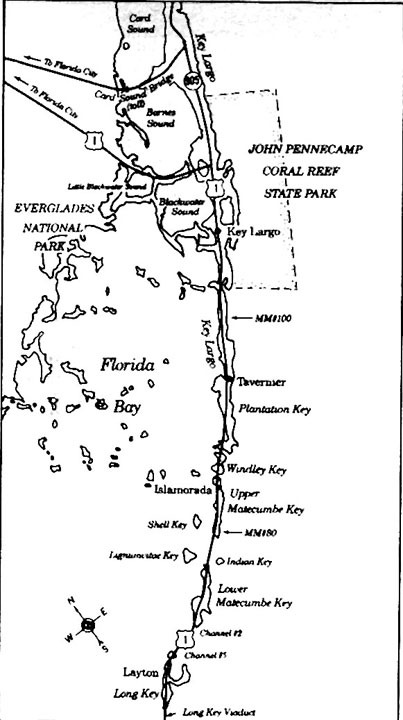 Plantation Key was unnamed on early Spanish charts. A 1717 chart by DeBrahm labels it as Bull Island. Three years later, the Gauld-Faden chart labeled it Long Island. My copy of the 1905 F.E.C. Railway survey chart shows both names: Long Island and Plantation Key. The 1870 census showed two families of Sawyers as sole residents of Plantation Key. Joseph and Mary Sawyer were farmers. Richard and Frances Sawyer had five children. Richard was listed as a seaman. In the 1880s, Joseph and Richard Sawyer homesteaded a total of 275.96 acres of northern Plantation Key. Other homesteading families were: Randall Adams, Absalom Albury, Frederick W. Johnson, Thomas Knowles, John Lowe Jr., Samuel Lowe and John B. Pinder. The Jacksonville, Tampa and Key West Railroad received 320.59 acres for track installed at locations outside of the Keys. The previously mentioned Harper's Monthly Magazine articles written by Dr. J. B. Holden in February 1871 reported: "Plantation Key has considerable good soil; many of its trees here [sic] are seventy or eighty feet in height. Here was a large plantation of cocoa-nut palms, several hundred in number and a patch of pineapples. A late paper gives an account of the products of this patch, which have been materially increased since the writer was there. Mr. Baker (Ben), the owner, who resides at Key West, is reported to have realized seven thousand dollars this season from his crop of pineapples." One of the best documented presentations of early Plantation Key is shown by the F.E.C. Railway survey map approved by J. C. Meredith, April, 1905. Plantation Key was also known as Vermont Key and was once considered two islands. Little Snake Creek ran between the ocean and bay and was clearly plotted on the map. The creek started about where Ragged Edge Resort is presently located and crossed the highway at mile marker 87 near Treasure Harbor. The southwest end of the key was known to some as Snake Creek Key. Little Snake Creek is clearly visible on the 1935 USGS aerial maps. Rum running was created by the passing of the Volstead Act, better known as Prohibition, which came into effect on January 17, 1920. Seafarers from the Bahamas and the Keys took advantage of their knowledge of the shallow waters and the relatively short distance involved. The Act was repealed on December 5, 1933. The F.E.C. Railway filled the creek when constructing the railroad and the ocean end of the creek reportedly became a favorite hiding place for rum runners. The 1905 railroad survey map shows one building on Snake Creek Key labeled "Mr. Roberts" on the ocean about across from the Venetian Shores entrance. No farming fields were indicated. The same map shows three ocean-side structures about a half-mile north of Little Snake Creek labeled "Jno. Pinder." This was no doubt the Johnny "Brush" Pinder who in 1903 built the 60-foot, 45-ton schooner "Island Home" there to transport pineapples, passengers and other goods to Key West and Miami. The Sugar Loaf, Queen, Red Spanish and Abbakkas are examples of varieties of pineapples raised throughout the Keys. The design of the ship Island Home was by Key Wester John Watkins, and the workmanship provided by a local Bahamian carpenter known affectionately as "Old Whiskers" Haskell. John Pinder built his schooner on his property, probably as indicated on the F.E.C. Railway survey map. Adjacent and behind the Pinder home on the map are pineapple and pear fields bisected with the survey line of the proposed railroad track. The Island Home was a design similar to other sailing vessels used by Keys plantation owners. It had a small four-passenger trunk cabin aft, a large hatch-covered cargo hold amidship and was powered by a jib, foresail, mainsail and gaffsail. The top of the cabin served as a place to sit, eat or just watch the sights go by. It was a cheerful sight to be seen from shore and became a part of early Florida Keys history. The details of the Island Home in the 1903 List of Merchant Sailing Vessels of the U.S. are: Gross tonnage 45, net tonnage 43, length 58.9, breadth 20.6, depth 4.8, crew 3; when built: 1903; where built: Plantation Key, Florida; home port: Key West, Florida and Official No: 100785. From these scattered records it appears that Plantation Key and Indian Key were the only Upper Keys that seriously constructed larger sailing vessels. Later, Willie Roberts of Key West built the Robert's Back Country Skiff in his Plantation Key shop. He later moved his shop to Tavernier. As the railroad doomed the pineapple industry in the Keys, the schooner Island Home was sold to Miami businessmen in 1923, but its picture is preserved in a carving on the doors of San Pedro Catholic Church on Plantation Key. Continuing with the 1905 F.E.C. map, about a half-mile north of the Pinder buildings are two structures, each labeled "School House." Monroe County School Board minutes dated August 17, 1891 contain the following: "After discussing the matter of erection of two school houses - one on Key Largo at Mr. Johnsons place [Planter] and one at Plantation Key, it was duly motioned, seconded, and carried that the Supt. contract for and build the two school houses above mentioned." In addition, a Jacksonville Sunday Times-Union dated April 10, 1898 carried an article that states, "Mr. Van Delden is in charge of the public school at Plantation Key, and is here on a visit." I found in Key West a diary written by Dora Perez, born in 1890. She noted sailing to Plantation Key on November 4, 1910 aboard the ship Mystery, which was constructed on Plantation Key. On November 4, 1910, she wrote, "School opened today with eight pupils; three boys, Cleveland Knowles, Alfred Knowles, and Courtney Thompson, and five girls, Emma, Mary and Sarah Pinder, Susie and Maud Adams. Susie was in my class in Key West. Saw the freight train pass. One of the men waved to us." On the 1905 F.E.C. map, a mile farther north are five homes labeled "Sam'l Lowe, W. H. Adams, A. Carey, A. G. Knowles, Thos. Knowles." Property abstracts show these family names, along with Cates, Russell and Parker, as property owners. This is in the area of Schooner Bay Road. There are five of the seven known concrete Red Cross houses in this area. Farther north and also on the Atlantic beach are four more structures labeled "Jno. Lowe." Both groups of houses had wharves. There was a legendary community on Plantation Key named 'Pearl City' on the ocean side of the Key. The 1905 railroad survey shows the aforementioned families on the ocean, but not the name Pearl City. If true, one group should have been Pearl City. The word pearl is thought to have come from finding unusual amounts of pearls in chonchs. The map shows three lakes on the northeast end of the Key. The largest was later known as Mud Lake and was located behind the San Pedro Catholic church. There is a channel entering from the bay and was reportedly used as a refuge for ships during storms. Directly across the island on the ocean are five structures and a wharf with the name "Jno Lowe." The other two lakes were in the vicinity of the present day traffic signal. The smallest was in the center of the right of way and was completely filled. The other, shown as about the same size as Dove Lake on Key Largo, was to the east and later filled. Engineer Krome's original plan was to fill and bridge straight from Tavernier, across the Tavernier Creek ocean flats to about Coral Shores High School instead of the present sweeping curve across the creek. Throughout the island are dashed lines indicating active and abandoned agricultural fields. They are labeled tomatoes, pine apples [sic], alligator pear, cocoanut [sic] grove, lime grove, sugar apple and oranges. I would estimate that about half of the hammock land is indicated as active agricultural uses. We know Plantation Key had pineapple plantations early in history, hence the name Plantation; yet, it never appeared to be considered a settlement as were Tavernier, Rock Harbor and Islamorada. As the 1905 F.E.C. map shows, there were six groupings of houses, with six structures as the largest grouping, almost equally spaced along the shore line. The 1926 F.E.C. Railway insurance list has a Plantation railroad station insured for $600, but no picture of this station can be found. It is also listed as a scheduled stop in a 1919 F.E.C. timetable. No records show a railroad siding on Plantation Key. The 1928 business brochure contained no commercial listings on Plantation Key. 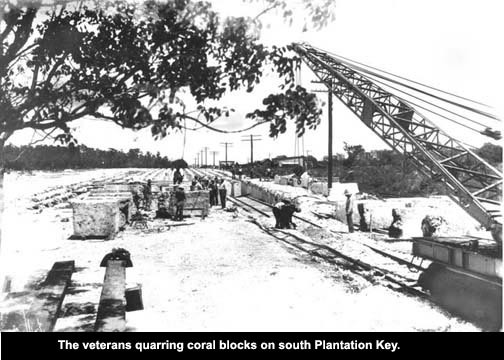 In 1935 the World War I veterans operated a relatively large coral rock quarry just north of Venetian Shores. It was bayside along the railroad (now U.S. 1) for easy loading onto train cars. The Federal Emergency Relief Administration had two projects to use the coral blocks. The photo is looking south and just north of the entrance to Venetian Shores. The principal government project was building a highway bridge to replace the ferry boats from Lower Matecumbe Key to Jewfish Bush Key, not Fiesta Key. Eight uncompleted bridge piers can bee seen bayside at MM-73/4 bayside. FERA was were also building a school building across the old highway from the Islamorada post office. The 1935 hurricane destroyed it all. Theater of the Sea at MM 84.5. It was established in right after WW-II 1946 when Kenny McKenny leashed the 1.7 acre former rock quarry from Alonzo Cothron. It is the second oldest marine mammal facility. They also offer swimming with dolphins, sea lions and stingrays. Fresh water is via an underground channel built by property owner Alonzo Cothron. Another of Plantation Key's landmarks is the McKee castle, former McKee Museum of Sunken Treasure. Arthur McKee Jr. worked as a diver for the Navy in 1941 and 1942 on the construction of the freshwater pipeline. In 1946 he begin excavating the remains of the 1733 lost Spanish fleet. Amongst cannons, ballast and other treasures were silver coins dated 1732. He brought up so many bars of silver that he gained the nickname of "Silver Bar McKee." His finds inspired him to form an incorporation and build a museum at Treasure Harbor in 1949. Three years later he opened his "Treasure Fortress," which is known today (1999) as Treasure Village. Art McKee is often referred to as "the father of modern treasure diving." Lately it is used as a Montessori school To learn more of Art McKee, please Check Here. Still another landmark is Plantation Yacht Harbor, formerly Plantation Harbor. According to the George Albury family, George sold the property to "nee" Renedo, a rich Cuban gambler up from Key West about 1939. He sold the property after WW-II to supposedly Mafia affiliate Meyer Lansky as an investment. Rumor has it that it was to be part of the Mafia's gambling empire. Another rumor is that Lansky's son, Buddy, spent some time as manager, but few facts are known. Another aspect, in an interview with fishing guide Roger Martin in 2007 Roger says that his father, Whitey Martin and Al Cornfield leased the Yacht Harbor from Lucky Luciano. His father sold his partnership to build a restaurant in Islamorda, Martin's Hafway House. Everett Albury, the Tavernier postmaster recalls that in 1953 an "Al Cornfield," P.O. Box 24 was the Yacht Harbor manager. Some subsequent owners was R.J. Renolds Co., Banker Rinerman and medical diagnostic manufacturer Coulter Manufacting Co. It is presently Founders Park and the location of offices of the Village of Islamorada. Back in the conversion days (~1938) putting the highway section on the Bahia Honda Bridge when blasting for rock-fill the hole for one of the blasts begin filling with crude oil. Word spread with under meaning of oil discovered in the Keys. The stories vary but the result was the 1941 Florida legislature passing the Florida Oil Discovery Award Bill. This awarded $50,000 to first producing oil well and I do not have the specific wording. Humble Oil company won with well near Immokalee a few years later, but World War II was in progress and seemed to slow wildcatting to an extent, or perhaps it diverted greed. Drilling on the bayside near Tavernier Creek began in 1949 under the auspices of Gulf Oil Co. Some place I have a photo but no to be found today. Apparently no usable amount of oil was not found but the details are hidden in the Gulf labs. I would not consider the case closed. In 1951, Coral Shores School, then the first and only high school outside of Key West, was constructed on Plantation Key. Students were transported from as far away as Marathon. It graduated its first class of 13 students on June 10, 1953. This was a sizable advancement as the Upper Keys were not permanently attractive to families with children of school. The sheriffs' substation was built in 1958. Before that law enforcement officers had to travel to Key West to take a prisoner to jail. The Florida Highway Patrol did maintain a station in Marathon that could be called for emergency assistance. Dr. Cohn moved his medical practice from Tavernier to Venetian Shores Medical Center, presently Cobra Marine. In 1962, Dr. Levin and others built the Overseas Hospital, the old Mariners Hospital. Also in 1962, a rural post office station known as Vacation Village was opened. A sub-courthouse for justice of the peace and other government offices was dedicated in March 1967. In the early 1960's the U.S. Coast guard operated from a two story houseboat referred to as "Surlfside 6" moored in Snake Creek. Hurricane Betsy in 1965 roughed up the ship and coupled with the increase of maritime drug running the existing building was proposed. It was not finished by Hurricane Inez in 1966, from locals it was totally completed and moved into by 1968. Before this it had operated from some sort of barge at several different Upper Keys locations. Construction Venetian Shores began in 1957. Sales of lots were slow at first, but the building boom made it one of the largest populated subdivisiona. Plantation Key became the center for Monroe County Upper Keys government activities (MM 88.8). Today, some of the county agencies are now at a new government center on Key Largo (MM 102). Judge Julio Gomez sat on the bench for the first jury selection in January, 1981. The court house remains at Plantation Key (2011). The Historical Society donated it 1733 anchor to the court house area.